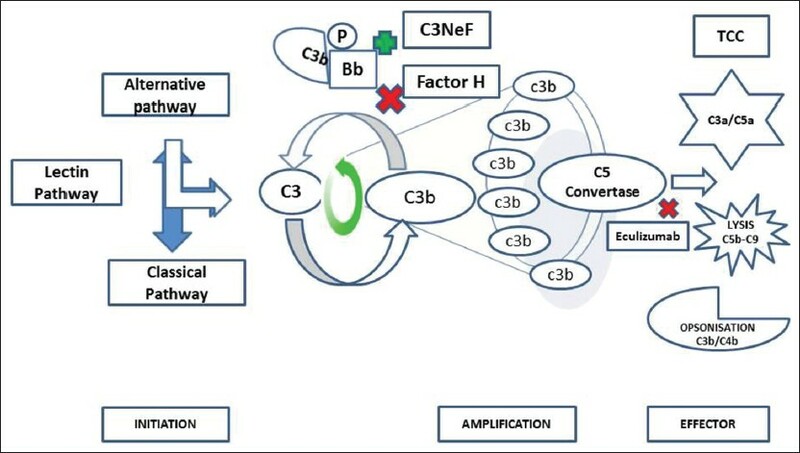 Complement component 3 glomerulopathy (C3G) is a recently defined entity comprising of dense deposit disease and C3 glomerulonephritis. The key histological feature is the presence of isolated C3 deposits without immunoglobulins. Often masqueradng as some of the common glomerulonephritides this is a prototype disorder occurring from dysregulated alternate complement pathway with recently identified genetic defects and autoantibodies. We review the pathophysiology, clinical features, and diagnostic and treatment strategies. Idiopathic minimal change disease is a disorder of T-cell dysfunction. The relative predominance of regulatory T cells (Tregs), Th1, and Th2 cells in nephrotic syndrome (NS) remains controversial. Imbalance in peripheral blood regulatory and effector T cells (Teff) are linked to cell mediated immune response and may be associated with steroid response in NS. Peripheral blood CD4 + CD25 + FoxP3 + (Tregs), CD4 + IFN-γ + (Th1), and CD4 + IL-4 + (Th2) lymphocytes were analyzed in 22 steroid-sensitive NS (SSNS) patients in sustained remission, 21 steroid-resistant NS (SRNS) and 14 healthy controls. The absolute percentage values and ratio of Th1/Tregs, Th2/Tregs, and Th1/Th2 were compared between SSNS, SRNS and control subjects. The percentage of Tregs was lower in SRNS patients (P = 0.001) compared with that of SSNS and healthy control. The percentage of Th1 cells was higher in SRNS (P = 0.001) compared to that of SSNS patients; however, it was similar to healthy controls (P = 1.00). The percentage of Th2 cells in SRNS (P = 0.001) was higher as compared to SSNS and controls. The ratio of Th1/Treg cells in SRNS (P = 0.001) was higher as compared to SSNS patients and controls. The ratio of Th2/Treg was also higher in SRNS as compared to SSNS and controls. 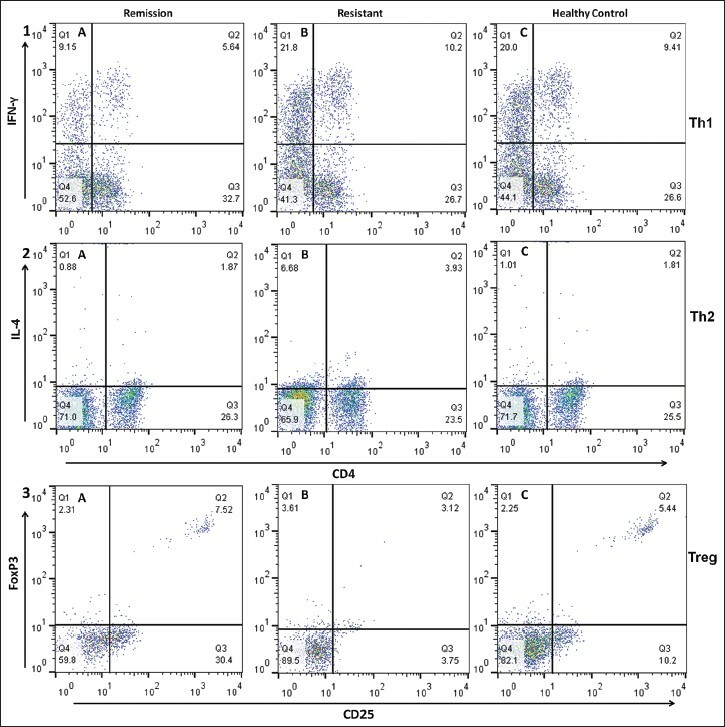 The ratio of Th1/Th2 cells in SSNS, SRNS, and healthy controls were similar. The cytokines secretion complemented the change in different T-cell subtypes in SSNS, SRNS and healthy controls. However, the IFN-γ secretion in healthy controles was low inspite of similar percentage of Th1 cells among SRNS cases. We conclude that greater ratio of Tregs compared to that Th1 and Th2 favor steroid sensitivity and reverse ratio results in to SRNS. The difference in ratio is related to pathogenesis or it can be used as marker to predict steroid responsiveness needs further evaluation. Patients on dialysis experience psychological distress, which can impact pain perception. Reduction of stress and anxiety in patients provides psychological resources to cope with their physical condition. We examined the efficacy of relaxation training on stress, anxiety, and pain perception of hemodialysis (HD) patients. eighty HD patients were randomized into two groups (intervention and control). Benson relaxation training was implemented in the intervention group for 15 min twice daily during 4 weeks. Pain perception, stress, and anxiety scale were evaluated before and after intervention. There were significant differences between pain perception, stress, and anxiety levels in case group before and after intervention (P < 0.001) and there was a correlation between pain perception with stress and anxiety. Instructing Benson's relaxation technique is accompanied by reducing pain, stress, and anxiety level of HD patients. Reducing stress and anxiety can provide calmness for the patients so that pursuing medical therapy would be accompanied with more tranquility and low pain intensity. We suggest improving and preventing the patients' psychological problems as well as other chronic disorders through applying nonpharmacological interventions. Tubular disorders form a significant proportion of pediatric kidney diseases and are an important differential diagnosis of failure to thrive (FTT) in children. Data regarding their outcome is scarce from India. We evaluated the clinical profile of these children and studied the outcome in terms of their growth and renal failure. This is a retrospective longitudinal study of all children with renal tubular disorders attending a tertiary care pediatric nephrology center from 2005 to 2010. Growth and renal outcomes were assessed by Z scores and estimated glomerular filtration rate at diagnosis and. The common disorders encountered were distal renal tubular acidosis (d-RTA) (44%), Bartter-like (Bartter's and Gitelman) syndromes (22%) followed by hereditary Fanconi syndrome (cystinosis and idiopathic Fanconi syndrome) (13%) and few cases of nephrogenic diabetes insipidus, hypophosphatemic rickets and idiopathic hypercalciuria. Male: female ratio was 1.22. The median age at diagnosis was 1.5 (range 0.13-11) years. Growth failure was the presenting feature in 86% of children followed by polyuria (60%) and bone deformities (47%). In 60% of children with hereditary Fanconi syndrome, nephropathic cystinosis was diagnosed, all of whom progressed to stage III chronic kidney disease (CKD) within 3.41 ± 1.42 years. With appropriate therapy, catch-up growth was noted in d-RTA and Bartter syndrome. Renal tubular disorders usually present with FTT. 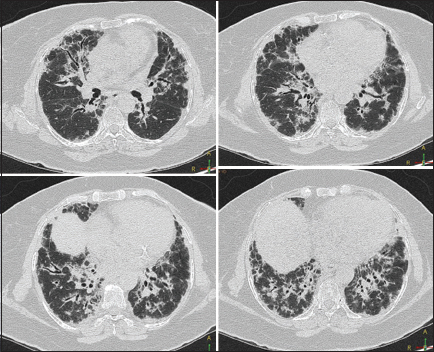 d-RTA is the most common etiology followed by Bartter-like syndrome. Renal function is preserved in all these disorders except for nephropathic cystinosis, who ultimately progressed to CKD. With appropriate and inexpensive therapy, these children do grow well. Diabetes mellitus is a common cause of pyelonephritis. 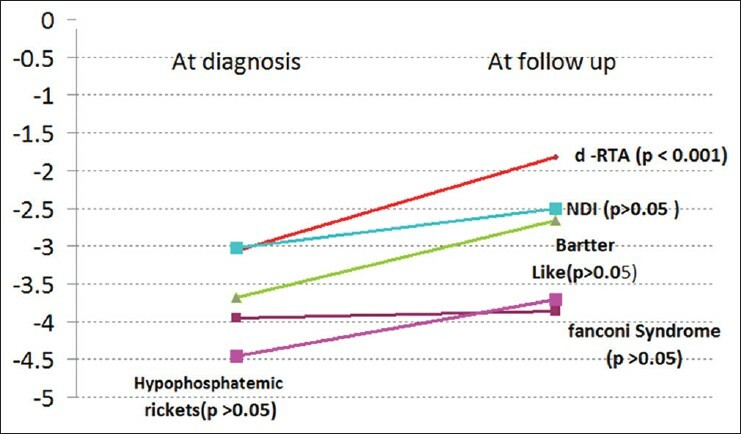 Both emphysematous pyelonephritis (EPN) and non-EPN (NEPN) are associated with poor outcome. This study was aimed at analyzing the clinical features, microbiological profile, prognostic factors, and treatment outcome of pyelonephritis in diabetic patients. A total of 105 diabetic patients with pyelonephritis were admitted from July 2010 to June 2012. Patients were treated with appropriate antibiotics and percutaneous drainage (PCD) as indicated. Nephrectomy was carried out in patients of EPN who were refractory to conservative measures. NEPN and EPN were seen in 79 (75.2%) and 26 (24.7%) patients, respectively. Escherichia coli was the most common organism. 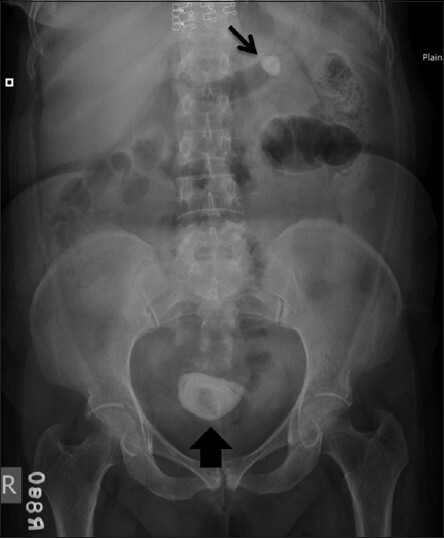 Pyelonephritis was associated with renal abscess and papillary necrosis in 13 (12.4%) and 4 (3.8%) patients with EPN and NEPN, respectively. Worsening of renal functions were seen in 92 and 93% of patients with EPN and NEPN, respectively. Class 1 EPN was seen in 2 (7.7%), Class II in 8 (30.7%), IIIa in 7 (27%), IIIb in 5 (19.3), and IV in 4 (15.4%) patients. Antibiotics alone were sufficient in 38.5% of EPN versus 62% in NEPN; additional PCD was required in 42.3% in EPN and 21.4% in NEPN. Nephrectomy was required in 5 (19.2%) EPN patients with Class IIIB or IV. A total of 13 patients (12.4%) expired, 4 (15.4%) in EPN, and 9 (11.4%) in NEPN group. Patients with EPN had a higher incidence of shock (6% vs. 0; P < 0.05) and poorly controlled blood sugar (26% vs. 50%; P < 0.05) compared with NEPN. Presence of shock and altered sensorium were associated with poor outcome in patients with EPN. Diabetics with pyelonephritis have severe disease. Patients of EPN have poorer treatment outcome compared with those with NEPN. However, there is no difference in the mortality, but a greater need of nephrectomy in EPN compared with NEPN patients. Presence of shock and altered sensorium at presentation were poor prognostic factors in EPN. 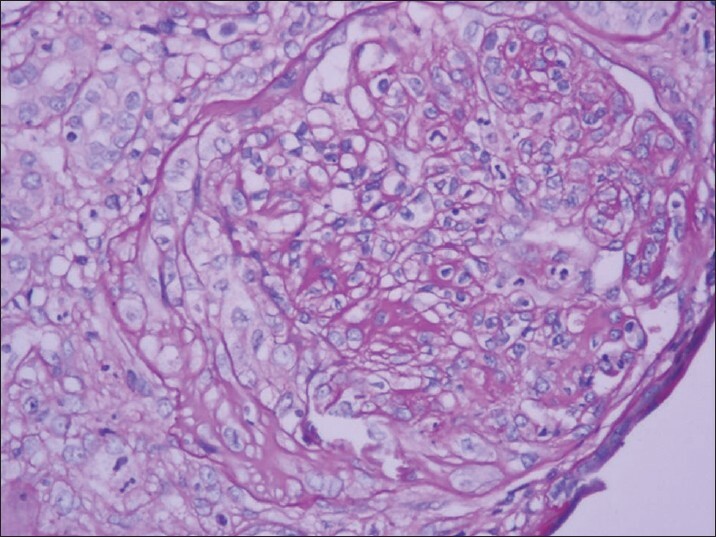 Proliferative glomerulonephritis with monoclonal IgG deposits (PGNMID) is a newly recognized entity caused by monoclonal deposition of IgG. 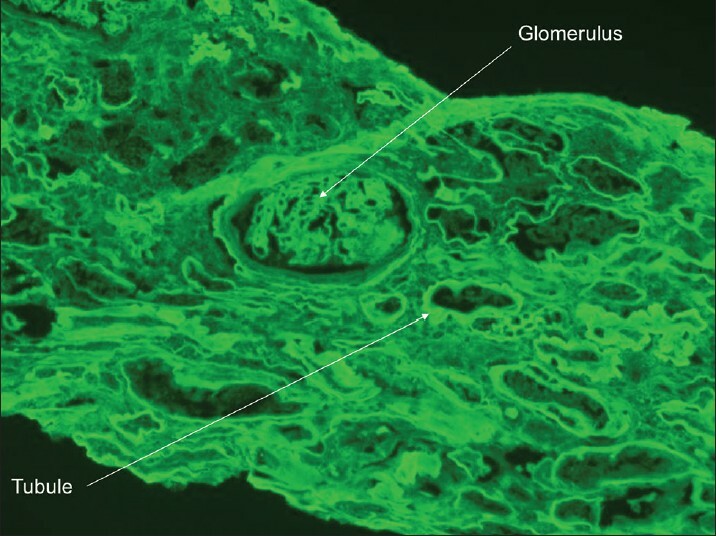 PGNMID resembles immune complex glomerulonephritis (GN) on light and electron microscopy. The monotypic immunoglobulin deposits seen on immunofluorescence (IF) clinches the diagnosis. We report a case of proliferative GN associated MGRS and review the relevant literature. The patient had significant proteinuria and elevated serum creatinine. 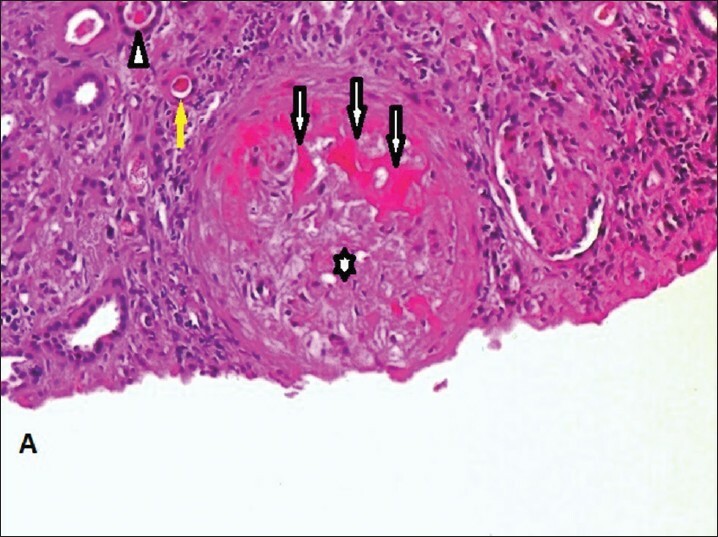 The renal biopsy showed proliferative GN with focal crescents and monoclonal immune deposits confirming a diagnosis of PGNMID. Serum work up showed no monoclonal proteins. Proliferative GN as a manifestation of a monoclonal gammopathy needs to be borne in mind especially in renal biopsies of older patients. 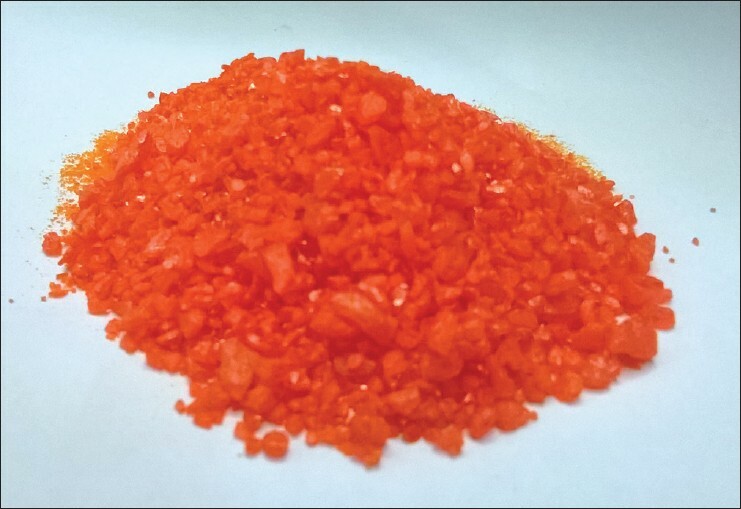 Ammonium dichromate is an inorganic compound frequently used in screen and color printing. Being a strong oxidizing agent, it causes oxygen free radical injury resulting in organ failure. We report a 25-year-old female who presented with acute kidney injury after consumption of ammonium dichromate. She was managed successfully with hemodialysis and supportive measures. This case is reported to highlight the toxicity of ammonium dichromate. 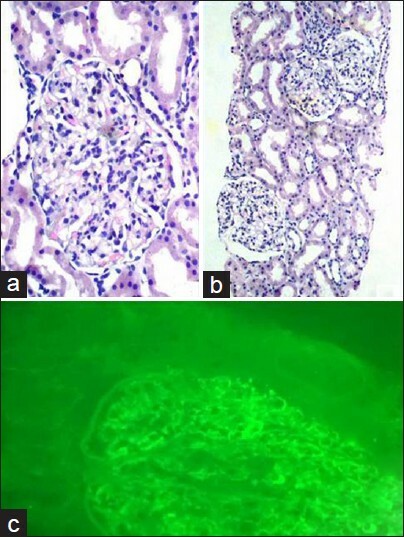 IgG4 related disease is a fibro-inflammatory condition with involvement of renal and extra renal organs, characterized by lymphoplasmacytic infiltration with organ dysfunction. 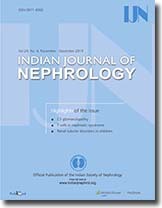 We describe three cases of IgG4 related renal disease from a tertiary care hospital in south India. Mitochondrial cytopathies (MC) are a rare heterogenous group of disorders with frequent multisystem involvement including uncommon renal manifestations. Acute kidney injury (AKI) as the primary manifestation of MC is extremely rare. Here, we report a case of recurrent episodic AKI in an adult male who was subsequently diagnosed to have mitochondrial disease. A young female with Plasmodium vivax malaria presented with anemia, hyperbilirubinemia, thrombocytopenia, and advanced renal failure. She remained anuric for more than 3 weeks. 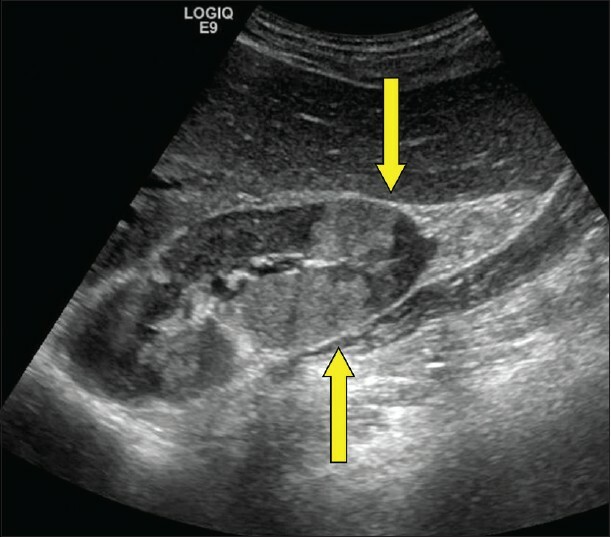 Kidney biopsy confirmed the diagnosis of acute cortical necrosis. During follow-up, she became dialysis independent, but remained in stage 4 chronic kidney disease (CKD) at 3 month. P. vivax is supposed to be benign in nature, but can lead to rare and severe complication like renal cortical necrosis and progress to CKD. Congenital methemoglobinemia is a rare condition resulting from a deficiency of nicotinamide adenine dinucleotide-cytochrome b5 reductase. Acquired methemoglobinemia may result due to certain drugs, chemicals and food items. Information on epidemiological determinants from India is sparse. 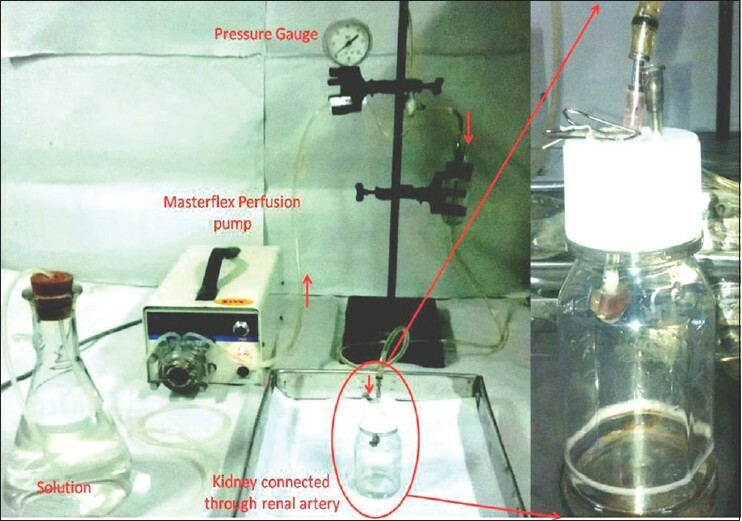 This report describes methemoglobinemia in a 4-year-old child after parenteral administration of quinine causing acute kidney injury. This case emphasizes the need of awareness of potential adverse events of antimalarial drugs. Prompt management of methemoglobinemia is essential to avoid potential life-threatening complications. 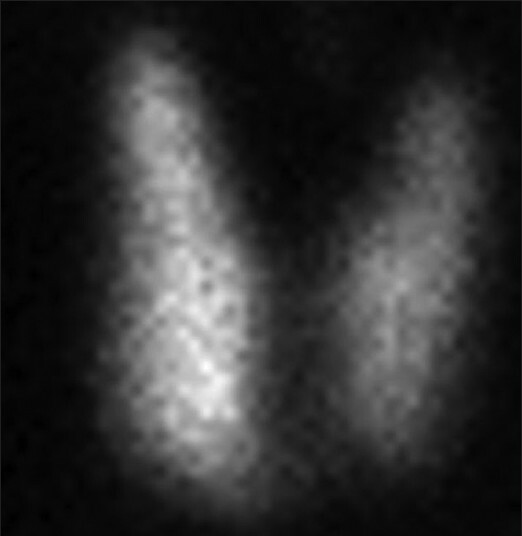 Thyroid hormone level may be altered in chronic renal failure patients. Low levels of thyroxine protect the body from excess protein loss by minimizing catabolism. Hyperthyroidism is rarely encountered in end-stage dialysis dependent patients. Less than 10 well-documented cases of Graves' disease (GD) are reported in literature so far. We report a case of GD in a patient on dialysis. A 45-year-old male on maintenance hemodialysis through right radio cephalic arteriovenous fistula (AVF) also had mitral regurgitation. He presented with fever and chills of 2 days duration along with pain and swelling at median cubital fossa of right upper limb. Local examination revealed warmth, redness, and tenderness at median cubital fossa. AVF thrill was absent. Echocardiography revealed vegetations on the mitral valve. 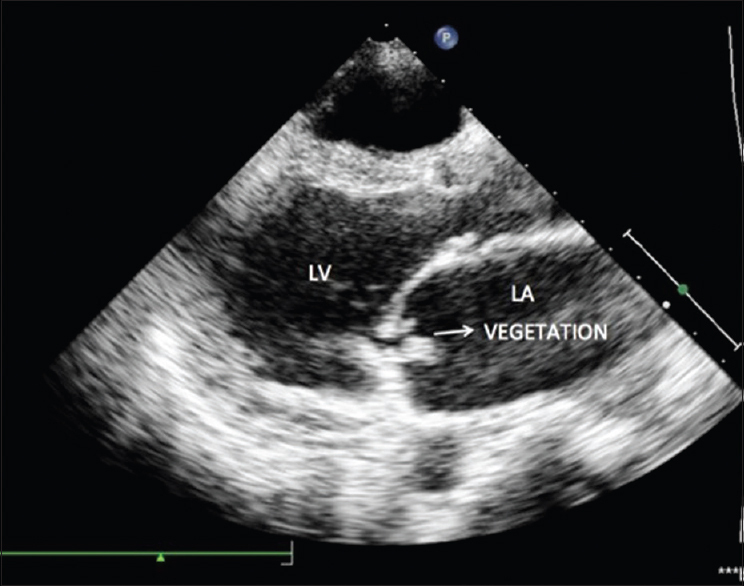 An extensive search of literature did not reveal an instance of embolic occlusion of AVF due to vegetations of infective endocarditis.